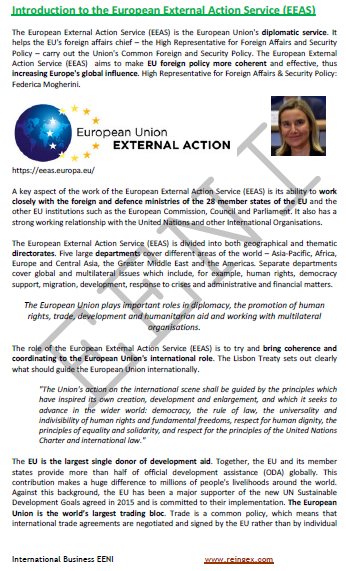 Syllabus of the Online Course (Subject): European External Action Service (EEAS) of the European Union. Learning materials in or Servicio Europeo de Acción Exterior Service européen pour l'action extérieure Serviço Europeu para a Ação Externa. The European External Action Service (SEAE) of the European Union was created in 2011 with the main objective of managing the EU's diplomatic relations with third countries, in addition to managing the European Union's security and foreign policy. One of the goals of the European External Action Service is to increase the European Union's influence around the world. 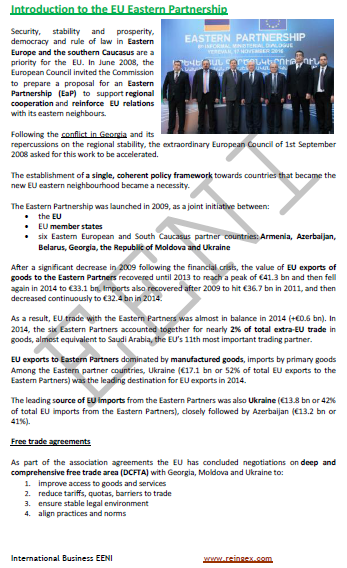 The European Union's strategic partnerships with third countries and the European Neighbourhood Policy are also managed by the European External Action Service (EEAS). Its head office is in Brussels (Belgium, Europe). The Chairman of the European External Action Service (EEAS) is the Vice-President of the European Commission, Federica Mogherini. 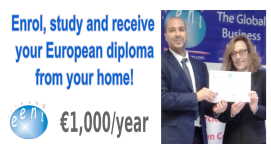 The European External Action Service is the European Union's diplomatic service and has a number of delegations (offices) abroad. The five major departments of the European External Action Service cover different areas of the world: Asia-Pacific, Africa, Europe and Central Asia, the Greater Middle East and the Americas. Currently, the European Union has nine Special Representatives in different countries and regions of the world. 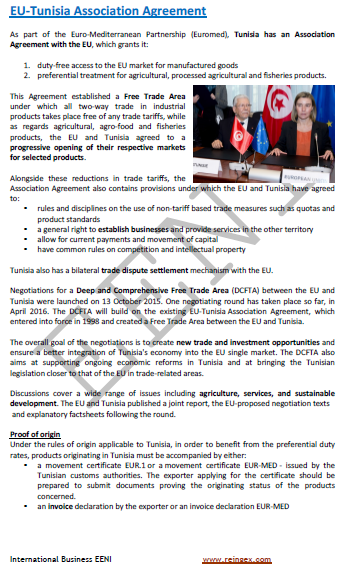 The EU Special Representatives promote the EU policies and interests in regions and countries with problems and are actively involved in efforts to consolidate peace, stability and rule of law. The nine Special Representatives cover the following countries or regions: Afghanistan, Bosnia and Herzegovina, Central Asia, the Horn of Africa, Human Rights, Kosovo, the Middle East Peace Process, the Sahel and the South Caucasus, and Georgian crisis. All the countries of the European Union (Austria, Belgium, Bulgaria, Croatia, Cyprus, Denmark, France, Estonia, Finland, Germany, Greece, Hungary, Ireland, Italy, Latvia, Lithuania, Luxembourg, Malta, the Netherlands, Poland, Portugal, Slovakia, Slovenia, Spain, the United Kingdom (BREXIT), the Czech Republic, Romania, and Sweden) are members of the European External Action Service.